Today XMission and UTOPIA are thrilled to announce that the base speed of residential XMission Internet service on UTOPIA is being raised to 250Mbps, from 100Mbps, at no additional cost for XMission UTOPIA subscribers. And here is the really good news. Most existing XMission UTOPIA residential subscribers will qualify for a free upgrade to 250Mbps*. So, how does this great news affect you? All new UTOPIA orders as of November 16, 2015 will reflect this major upgrade for the same price XMission and UTOPIA have charged for years. The basic XMission residential service on UTOPIA is now 250Mbps download and upload. The cost is $35 to XMission, and $30 to UTOPIA (on a lease model). Your total cost for 250Mbps is $65/month! Now, this means that thousands of subscribers will be upgraded, and this will take some time. Your position in line is based on the fiber hardware in your home (Zhone or Allied Telesis) and your account type (“Legacy” or current). Newer subscribers with a Zhone are mostly immediately eligible for an automatic upgrade. Those with an older Allied Telesis will require a new fiber hardware install from UTOPIA. First, let’s identify the roll out schedule for customers that will require a new fiber access portal in their homes. The older Allied Telesis units deployed by UTOPIA years ago are not powerful enough to push the full 250Mbps into your home and must be replaced. If you are an original subscriber to UTOPIA services from years back, chances you are a “legacy” subscriber. This means that you are grandfathered into a 50% discount on infrastructure fees, to a total of $15 per month. Legacy UTOPIA users on XMission can identify themselves by the fee on their monthly invoice called “UTOPIA Maintenance Fee” (a few users may see this as “NAF” or “Network Access Fee”). In an effort for UTOPIA to streamline their contract options, UTOPIA is requiring any current legacy customer who would like to transition to the 250Mbps product to sign a new contract with UTOPIA. For most, this is effectively a cost increase of $15 per month for the upgrade to 250Mbps. To be clear, this normalizes their cost to that of all other UTOPIA subscribers. There is no commitment for this upgrade, and it is entirely optional. You are welcome to keep your current rate and keep your 100Mbps XMission UTOPIA service. Your new monthly price would be $65.00 vs your current $50.00 ($35 from provider and $30.00 from UTOPIA). And again, if you chose not to transition to the 250Mbps you can continue to stay on legacy pricing and keep receiving your current product of 100/100Mbps offering. If you would prefer to stay at 100Mbps, simply continue paying your current $50 per month. 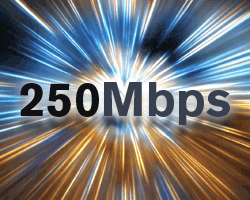 If you prefer to upgrade to 250Mbps, please read on. Legacy subscribers, as defined above, who already have a Zhone access portal installed in their homes can call UTOPIA immediately to upgrade to the 250Mbps service upon activating the new month-to-month contract for leasing UTOPIA infrastructure. Only a very few number of UTOPIA subscribers fit into this category. If you are a Legacy subscriber with a Zhone Access Portal installed and you’re ready to upgrade, please call UTOPIA Customer Service any time between 9AM and 5PM Mon-Fri to establish a new contract at 801-613-3880. You can do it today! As stated earlier, subscribers that still operate on the Allied Telesis access portal will have to have their hardware physically replaced. This will require the work of a UTOPIA crew in your home, and managing this will require a significant effort on the part of UTOPIA. Rollout will follow the city-by-city schedule listed above, but will also require a new, month-to-month contract that will normalize your pricing to the current lease charge. As above, there is no commitment for this upgrade, and it is entirely optional. You are welcome to keep your current rate and keep your 100Mbps XMission UTOPIA service. Many XMission subscribers with the Allied Telesis access portal installed will need to have a UTOPIA crew swap this device for a newer Zhone. This will be performed on the schedule above at no cost to you. Please consult this schedule to have a basic understanding as to when your city will be eligible for the upgrade installs. You will be directly notified when UTOPIA begins to schedule upgrade visits and informed as to how you may schedule your own. All upgrade visits will be scheduled directly through UTOPIA. Please do not call XMission for this scheduling as we are unable to help you at this time. Don’t want to wait for your city? Expedite your upgrade! We know you’re excited! And so does UTOPIA. In fact, we know that some people will not be able to contain their excitement to wait for their city scheduling to arrive. UTOPIA has a plan for you! For $50, UTOPIA users who require physical installation to replace their Allied Telesis access portal with a Zhone can jump ahead of the line. Look for more information on this program in the near future. UTOPIA will begin upgrade installations shortly and will launch this program soon after. XMission would like to make one last important observation. Be aware that 250Mbps is a residential connection so advanced that most entry-level consumer grade home routers will not be powerful enough to support it. Many top out at 100Mbps, and have wifi that maxes out at a fraction of this. 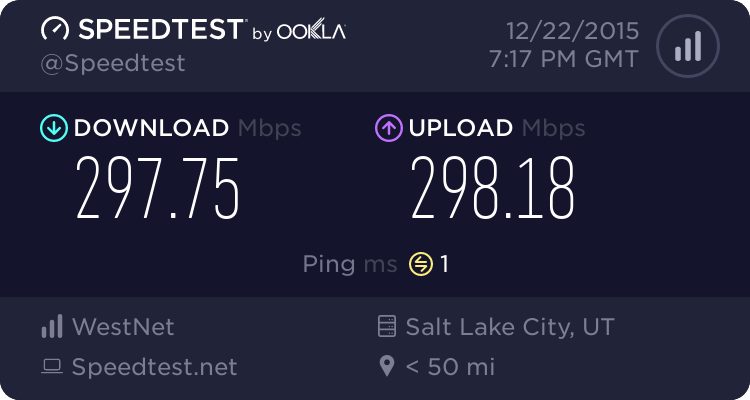 If your connection is upgraded and you are not experiencing close to the full 250Mbps speeds, first make sure your hardware can support it. And it is not just routers, older computers may have on-board Ethernet ports that are only capable of 100Mbps data rates. But watch for more options soon! We’re working on some fantastic solutions for your XMission Internet connection. More questions? Please email XMission customer service at support@xmission.com. We request you not call on this subject unless you have an emergency of some sort, due to the simple fact that, while we are well staffed to serve you, we are not able to handle all of our UTOPIA customers calling all at once. Thanks for being our subscriber! XMission and UTOPIA remain committed to bringing you the best Internet connection in Utah, and we thank you for your continued support of this public/private project. According to my call to Utopia, for those of us that have paid the full $3,000 Utopia install and don’t have a monthly Utopia fee, there is not a new monthly fee for this upgrade to replace the Allied Telesis equipment and go to 250m. You are correct! This is a small group that didn’t get mentioned in this initial announcement. Thanks for letting everyone know. If I am a Legacy customer with Allied Telesis equipment and I choose to stay at 100 mbps, will my access portal still be swapped out? If not, can I choose to upgrade at some point after my city roll-out is completed? Good question. There should be no reason to upgrade your terminal if you are not getting the upgraded service at this time. If you do choose to add service in the future that would require a new device it will be installed at that time by UTOPIA. And there is no expiration date on this offer. Just read this notice, checked my speeds this morning – >300Mbps – lovin’ it! I live in the artspace common’s and have existing internet, will mine upgraded to the 250mbps? Artspace is not part of the UTOPIA network, unfortunately, but Artspace residential tenants are still able to burst to 100 Mbps for quite a bit less than the cost of UTOPIA. I am a “legacy” customer as indicated on my bill, but already pay $65 total for Utopia + XMission for 100/100 (NAF or “Network Access Fee” appear on my bill). I do however have Telesis hardware. When do we hear more about the $50 “I want it now” option? Bryan, you are likely eligible for a reduced rate. Call our sales department when you can, 801-539-0852. I expect UTOPIA will announce the expedite service in the next couple of weeks. We will let you know! Not only do I love this news, I also love the router recommended by XMission; the TP-Link Archer C7. XMission has remained diligent to protecting client data so it truly should not be a surprise they endorse a WiFi router company who has emulated this same ethic for their End-User Home Router lines. #Oorah #XMission for choosing the leaders in WiFi security for transmission of your above the mark signal!!! i had xmission 100mbps installed in sept, i called and they said i would receive the upgrade soon, is there any chance i can get eta on the upgrade in tremonton. Per the rollout schedule we have been given (which is included in the article above for future reference), Tremonton is scheduled for upgrading in Quarters 2 and 3 of 2016. Must be nice if you got it. Any word on Utopia or Macquarie expanding their network to us poor savages still stuck using smoke signals. Copper is so last-century. UTOPIA is expanding its footprint within existing cities right now for the first time in quite a while, but there is no plan of adding new cities that I am aware of. No word from Macquarie in a while. I live in Cottonwood Hts. Xmission is my ISP, but my service is provided by Qwest. Does any of this upgrade affect me? I’m afraid this information pertains only to the UTOPIA fiber network, which Cottonwood Heights does not participate in. I’d like to expedite my upgrade from Allied Telesis to Zhone. I don’t see any follow up info from utopia or xmission on how to do this. I just got the bump today after Utopia dropped in the new fiber gateway here in Centerville! so if I live in Orem I can’t “buy” the expedited upgrade until end of 2016 is that right? Roger, that is not right. You can order an expedited upgrade today for $50. However, if you wish to save the cost of the fee, you can order a free upgrade during Q4 2016 when UTOPIA is actively upgrading Orem. I live in Centerville. When can I be expected to be upgraded. Have been using Utopia for almost a year. Centerville is scheduled for upgrades about a year from now. I understand there is chance the timeline will move up a bit as things are going more quickly than expected, but that’s the latest information we have. Note that for a $50 upgrade fee, UTOPIA will come out to your home and get you the upgrade at any time. You can coordinate directly with UTOPIA for this service by calling them at 801-613-3880. Devin, if you have a Zhone installed at your location already you should have been automatically upgraded to 250Mbps some time ago. If you feel you are not seeing the speeds you expect, feel free to call our tech support . We’ll be happy to take a look at it with you and fix anything that needs fixing. It turned out to be an issue with my router, which I got worked out. Everything is working great now!!!!!! Thanks for your help.